Smart homes and cars, connected appliances, the start of the robot uprising. Well, hopefully not the last part, but IoT is an interesting and prospective niche that is currently on the rise and will only continue to grow in the foreseeable future. If you have dipped a foot into the developer side of things at some point, you probably know that Google already has some solid efforts in the field, with things like the Weave cloud platform for connected devices. 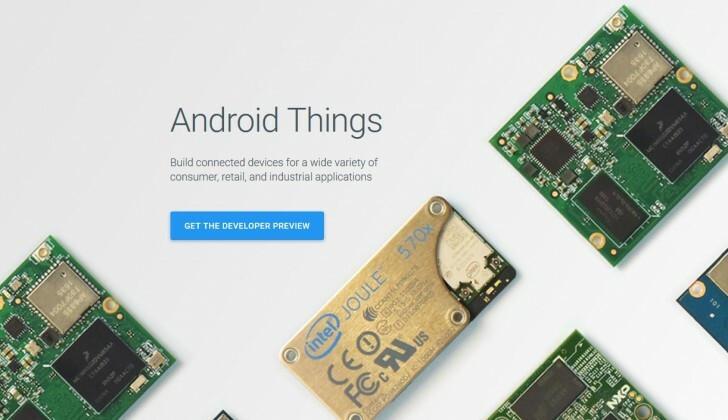 Now the online giant has amplified its efforts even further with the announcement of Android Things. In a nutshell, it is an Android-based OS, designed to bring the power of the popular mobile OS, complete with its varied APIs and services to IoT devices. This should theoretically allow existing Android developers to quickly migrate over to the exciting new IoT realm. Currently Android Things is available as a Developer Preview for a number of popular development boards, including Edison, NXP Pico, and Raspberry Pi 3. Google says that even in this early stage of development, eager adopters and testers will already be able to enjoy a lot of familiar tools, like the Android Studio and SDK, as well as access to Google Play Services and the Google Cloud Platform. Future updates to the OS will also bring the required infrastructure for delivering OS patches, security fixes and updates to end users. Speaking of the Weave, the cloud platform will only grow in the coming moths. The search giant has already announced that it will be adding it into Android Things for extra smooth cloud service integration. Currently, the Weave Device SDK has support for light bulbs, smart plugs and switches, and thermostats and this list will grow. Plus, there is a mobile application API for both iOS and Android to leverage. And last, but not least, Google will soon merge the Weave and Nest Weave platforms in one seamless package. All things considered, now is a great time to hop on the IoT wagon with a Google ticket. The future looks bright and you will be joining some major players, like Belkin WeMo, LiFX, Honeywell, Wink, TP-Link, and First Alert, to name a few.